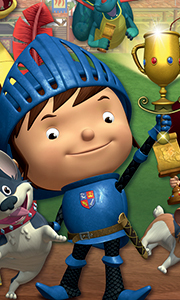 Own Mike The Knight - A Little Knight Music DVD from Deff, DVD, Blu-Ray & 4K Video Specialists - Free UK Delivery..
Own Mike The Knight - Be A Knight, Do It Right DVD from Deff, DVD, Blu-Ray & 4K Video Specialists - Free UK Delivery..
Join Mike and his friends on their adventures to serve and protect the Kingdom of Glendragon! As Mike's best friend and trusty steed, Galahad is always there for Mike. In 'Galahad the Great' Mike is determined to be the best horse trainer in Glendragon. He wants Galahad to look perfect - really knightly! Galahad faithfully wears whatever Mike suggests but the bells on his hooves stop him from "Silent Sneaking" and the new heavy saddle s..
Own Mike The Knight - Glen Dragons Secret Adventure DVD from Deff, DVD, Blu-Ray & 4K Video Specialists - Free UK Delivery..
Join Mike and his friends on their adventures to serve and protect the Kingdom of Glendragon! Mike is a knight in training who has some very knightly missions to complete. On every adventure Mike is joined by his merry band of friends - Sparkie and Squirt, two playful dragons, and Galahad, his trusty steed. Mike's little sister, Evie, a wizard in training, casts a spell on Mike's sword which causes magical mayhem during their knightly m..
Own Mike The Knight - Journey To Dragon Mountain DVD from Deff, DVD, Blu-Ray & 4K Video Specialists - Free UK Delivery.. When Trollee wants to be an apprentice to both Mike and Evie, he learns that being a knight or wizard is not as easy as it looks! A jealous Mike soon discovers that Trollee is better than him at target practice, so Trollee becomes determined to go on a knightly mission alone. Elsewhere, Evie's wand falls into the wrong hands, Sparkie ruins some dragonberry pies and, after finding a treasure map, Mike sets off to collect knightly things ..
Own Mike The Knight - Knightly Magic DVD from Deff, DVD, Blu-Ray & 4K Video Specialists - Free UK Delivery..
Own Mike The Knight - Magical Mishaps DVD from Deff, DVD, Blu-Ray & 4K Video Specialists - Free UK Delivery..
For many years, generations of the best and bravest knights have attempted to solve the legendary 'Knight's Puzzle', and now it is Mike's turn! However Mike's mission heads in an unexpected direction when his arch rival, Edward, steals the puzzle. With the safety of the kingdom in his hands, Mike sets off on a brave journey. Join Mike on a thrilling, edge-of-the-seat adventure to retrieve the stolen Puzzle and protect the Kingdom of Gle..
Own Mike The Knight - Mikes Magical Christmas DVD from Deff, DVD, Blu-Ray & 4K Video Specialists - Free UK Delivery..
Own Mike The Knight - The Christmas Star DVD from Deff, DVD, Blu-Ray & 4K Video Specialists - Free UK Delivery..
Own Mike The Knight - The Golden Arrow DVD from Deff, DVD, Blu-Ray & 4K Video Specialists - Free UK Delivery..
Own Mike The Knight - The Great Exploration DVD from Deff, DVD, Blu-Ray & 4K Video Specialists - Free UK Delivery..
Own Mike The Knight - The Magical Challenge DVD from Deff, DVD, Blu-Ray & 4K Video Specialists - Free UK Delivery..